Abingdon was occupied in prehistoric times by settlers of the Bronze and Iron ages. It was a flourishing town in the Roman period, which in turn gave way to a Saxon settlement. The earliest documents tell of a hamlet called Sevekesham sited at a ford of the Thames. Hean, nephew of King Cissa was granted land for founding a Benedictine monastery called Abbandun (Hill of Ebba) at the same time as his sister Cilla founded the Nunnery of Helnestowe on or near St Helens Church, the principal church in 675AD. When Henry VIII dissolved the monasteries in 1538, Abingdon Abbey was the 6th richest in Britain. The Monday market has existed since 1556. The Michaelmas Fair (now known as the Ock Fair) was originally a 'hiring mart' for those seeking employment. In 1810 the Wilts and Berks canal arrived with Abingdon becoming a key link between such places as Bristol, London, Birmingham and the Black Country. In 1906 it was abandoned as the canal sides collapsed and the railways offered faster transport. The first link to the railway came in 1856 with a branch connection to Culham and subsequently via Radley. The local station closed in 1963. 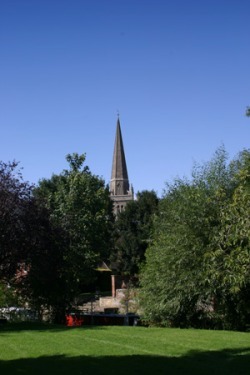 Abingdon was the county town of Berkshire, becoming part of Oxfordshire after local government re-organisation in 1974. MG This famous logo became synonymous with fast, sporty two seater cars which were manufactured in Abingdon for 50 years until production ceased in 1980. Since 1946 a number of scientific establishments have been set up in the area including the Harwell International Business Centre and the JET (Joint European Torus) project at Culham. Many high-tech industries have been drawn to the area alongside local trades such as printing and brewing which continue to prosper alongside. Two of the main roads into Abingdon cross rivers - the Thames and the Ock - over bridges listed as ancient monuments. The bridge over the Thames is over 550 years old. 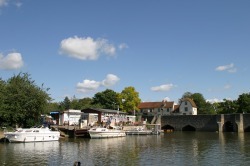 The Thames has always been important to the town and today is a focal point for many recreational activities. Riverside gardens attract vistors, anglers fill the riverbanks and pleasure cruisers queue to pass through the picturesque lock. 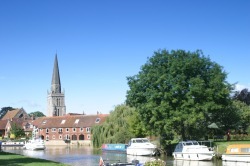 Abingdon is within easy reach of both the M40 and the M4. There are several racks of local attraction and information leaflets as well as some menus for local pubs and restaurants please feel free to help yourself to these. Buses: - We have a very good bus service into Oxford with buses running every 15 mins these run from the bus stop which is just 50 yards from our drive to the left. On you return from the city centre just ask for the Ox Public House stop on the Oxford Rd. From Oxford there are busses running regularly to London and other parts of the country. Taxis: - we have several numbers for taxis we have found Top Cabs 01235 537333 to be reliable please remember to confirm charges before you start your journey. Open: Daily 10.30am - 4.00pm. Ring to check Bank Holiday opening times. Admission: Free (Roof visits adults £1.00, children 50p). Children aged 6 or under are not permitted on the roof. The County Hall, built between 1678 and 1682, was called by Nikolaus Pevsner "the grandest town hall in England". The Museum collection was established in 1919 and houses objects from all periods of Abingdon's history and runs a programme of events and exhibitions. Beautiful family-owned manor house, originally dating from the 1660s. Garden centre, maize maze, farm shop, farm zoo, children's play area, restaurant and picnic area. Milton Manor House - 3 miles to the south. Believed to be designed by Inigo Jones with a Strawberry Hill Gothic Library. St Helen's Church, on West St Helen's Street, dates from the 13th century. Its 600 year old painted ceiling is a medieval masterpiece which has been recently restored. Sutton Courtenay, A pretty village - George Orwell (author of 1984) and Herbert Asquith (Prime Minister 1908-1916) are buried in the local churchyard. Wittenham Clumps - 5 miles SE. A group of trees visible for many miles above Castle Hill (an iron age fort). Below, on the Thames, lies Thames and Day's lock - scene of the annual Pooh Sticks world championship. Visitor Facilities: Toilets & car park nearby, gift shop, picnic area, guided tours by arrangement. Disabled Access: Some disabled access with help. The museum building dates from the 14th century. The museum is in the grounds of the former Dorchester Abbey, which can be visited.